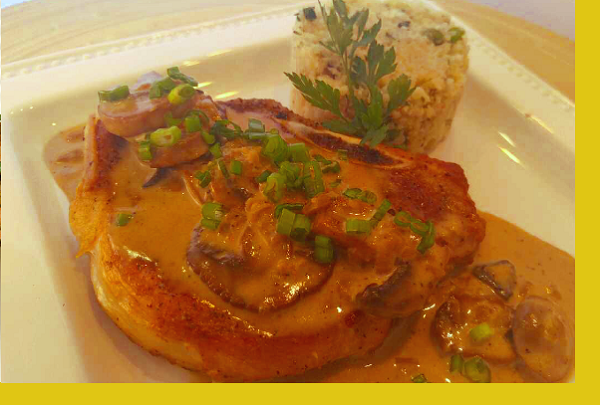 Seared then baked bone-in, juicy pork chops smothered in a brandy mushroom cream sauce served together with a healthy cauliflower rice. A great tasting low carb dinner. Preheat oven to 350F. Coat a pan with oil and heat on high heat. Season pork chops with salt & pepper. Sear 2 mins per side, in batches if necessary, then place in provided pan. Bake in oven for 15 minutes or to 145F for medium or 160F for well done. Remove excess oil from saute pan, add brandy cream sauce and bring to a boil, then serve with pork chops. Cauliflower Rice: Coat a pan with oil and heat on medium heat. Add cauliflower and saute for 3 minutes. Reduce to low heat and continue to stir to desired tenderness. About 10-15 mins. total. Season with salt and pepper to taste. Add peas and warm thoroughly for 1 min. then serve. The quality of the pork chop was great. Needed cooking a little longer than instructed but was so flavorful and tender. The sauce was great. I will definitely order them again! LOVED this meal!! Great sauce and cauliflower rice was amazing! This was our favorite meal that we've had. Very easy cooking and the cauliflower rice was so tasty. Would love to see it as a side more often! Generous portion size and sauce was delicious as always. 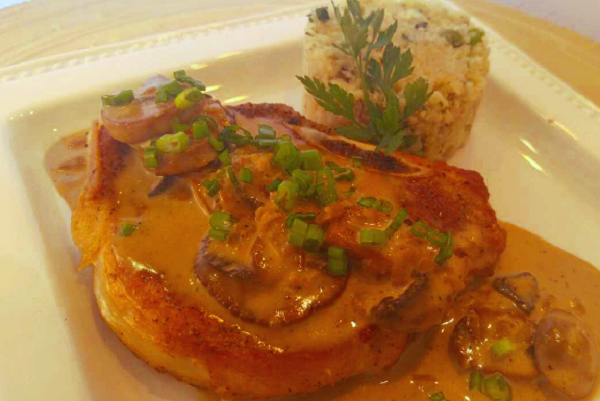 We LOVED these pork chops and the sauce was delicious!! It was our first time to eat cauliflower rice and we loved it!